As you look at photographs, note the plant vegetation in the various habitats in pictures, above ground or underwater. The vegetation helps animals in those ecosystems to survive in different ways in their particular habitats. Vegetation provides shelter and food, or sources of food. Not all animals eat vegetation, but they can find other food sources within the vegetation. Vegetation also provides hiding places from predators, and protection from the elements such as heat or severe weather. Some animals need very specialized vegetation, such as Pandas who need bamboo to survive. Giant Pandas are rare and protected as endangered. They can eat up to 85 pounds of bamboo shoots per day, so they need to live where there is an abundant supply of bamboo. Animals choose to live in ecosystems where they can find the things they need to survive. Amazingly, some live organisms thrive on sewage, and toxic chemicals (such as near super-hot hydrothermal vents in the deep sea)! Natural habitat is disappearing at an alarming rate, degrading and depleting the functions performed by ecosystems, and endangering life forms that make up the biodiversity on our planet. Biology4Kids - Pictures from the biological world. Click on alphabetical list of organisms to bring up photos and classification information. See links on the right side for more details and additional topics. 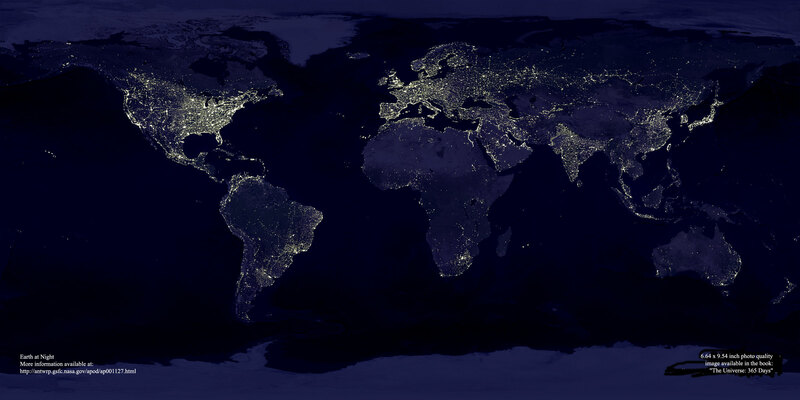 Global population density seen from illumination of lights in cities and towns. Urban and suburban human habitats are consuming the natural landscape at a rapid rate. Earth Science Picture of the Day (EPOD) Plus 5 1/2 years of archived photos. Spectacular photographs showing diverse processes and phenomena within the Earth system. Explanatory and educational captions are provided with each image. Scroll down below captions to find links to related or relevant information. Archives are available for viewing and you may also search for photos by keyword. Some captions include instructional tips regarding camera settings. The information provided with the photos is extremely interesting. Geoscience images contributed by leading geoscientists and photographers. Most imagery is available for use in your non-commercial efforts, such as educational slideshows or in personal materials. Read details on Image Use. Photo galleries of species on the International Union for Conservation of Nature and Natural Resources (IUCN) "Red Lists" of species threatened with extinction. IUCN works together with the world's leading scientists in assessing the status of species, subspecies, varieties and subpopulations of biodiversity on a global scale. See latest news pictures, or search by keyword, sort by relevance or date, search archives by topic. Great Barrier Reef Image Gallery (Great Barrier Reef Marine Park Authority, Australia) Vast pictorial resource containing spectacular images of Australia's most famous natural wonder - the Great Barrier Reef. Search for images by typing in search words. Suggestions are in the Online Image Catalogue. Note allowable use is restricted for educational purposes. Luminous Organisms - Scroll down through luminous images on left side of page. Click on images to bring up enlarged view with information about the organism. Turn lights off for best effect. For more information, go to Home Page (Bioluminescence Web Page link at bottom). Photo Library - See what's New on the main page. Also click on Photo Albums. Links to public domain digital images of our national heritage, including parks, monuments, historic sites and related areas. NatureZoo.com Click on Photos link. Click on thumbnail size photo to enlarge. Library of over 15,000 photo images of plant species and plant habitats. See photos of Deep Space, Solar System, Planet Earth, Space Exploration, Space Art and Movies. The Virtual Field Herbarium - Field Guide focusing on identification of tropical forest plants. Includes a searchable image database, glossary of descriptive botanical terms, and a linked list of regularly-published scientific journals specializing in plants. The importance and benefits of Field Guides - long-term compilation of inventory of species composition, identification of local and regional species, conservation of biodiversity, protection of threatened and endangered species, monitoring species populations, identification for control of invasive or dangerous species, and promotion of sustainability and commercial and socio-economic benefits. 25,610 images of plants, animals, people, Africa, landscapes and habitats. Searchable indexes help you find photos of specific subjects. Searchable directory of images, visualizations, and animations of the Earth. Agriculture, Atmosphere, Biosphere, Cryosphere, Human Dimensions, Hydrosphere, Land Surface, Oceans, Radiance or Imagery, Solid Earth, Locations, and Satellites/Sensors. Photographs of various rated weeds listed by common and scientific names, including data sheets.